Welcome! This lab consists of several mini-labs that focus on particular areas or components of systemd. Overall, systemd is relatively simple to learn and, thanks to the excellent documentation the project has, even advanced functionality is simple to reference when needed. Local VM running your favorite distro. Note: The systemd specific parts of this lab will work on any distribution that ships a recent version of systemd. The parts of this lab that are *not* systemd specific were written using Fedora 24. You are welcome to use any distro, but if you do use an alternative option, you’re responsible for translating things like rpm/dnf, package names, etc. Verify that you are running a version systemd >= v208. Systemctl is the primary tool for interacting with systemd. Although the `service` and `chkconfig` commands still function it is highly recommended to switch to systemctl to take advantage of the full capabilities. Scenario: Discover how this system is setup and configure a basic LAMP server. First, let’s make sure bash-completion is installed. This will give us a much nicer environment for working with systemctl. `rpm -qa |grep bash` if not present install via: `sudo dnf -y install bash-completion` If it was not installed you’ll need to logout and back into your terminal. With the shell configured, let’s take a look at the system boot stats. Let’s identify the default target, which is similar to the concept of a runlevel. Let’s look at what’s installed and running on the system. Open a terminal and run `systemctl status`. This shows a nice summary of the system. Just running `systemctl` w/ no verbs or arguments will show the state of every unit on the system. This can be a bit much to look at on some systems. Let’s filter it by services: `systemctl -t service`. This is similar to `chkconfig --list` except it will only show the loaded units, or basically which services are currently running. Run `systemctl list-unit-files -t service` for a more complete list of installed unit files. This will include unit files that are not currently loaded. Compare the output of this command with the previous one. Now that we have a good idea of what’s installed on our systems, let’s get a basic lamp stack running. Next, let’s set these to start on boot. Now start the services: `sudo systemctl start httpd mariadb` and view their status: `systemctl status httpd mariadb`. **TIP** Depending on the size of your terminal you might want to run the status command separately for each service. **Notice we can see the service is “enabled” to start on boot, current status, the main and worker PIDs, cgroup hierarchy, and the last 10 log messages. Run `systemctl -t service. Now we can see both httpd & mariadb in the list now. Which unit will be started first? Now take a look at `systemctl status httpd mariadb`, under “Loaded” compare the status vs the vendor preset. Another nice trick systemctl gives us is the ability to start/stop & enable/disable in a single command. First stop the running services: `sudo systemctl stop httpd mariadb` and now verify they are not running: `systemctl status httpd mariadb`. This can be reversed with `systemctl disable --now httpd mariadb`. Go ahead and run this so the services are prepped for the next lab. systemd unit files are declarative config files that follow a syntax similar to Windows ini files. They’re simple to create and are incredibly powerful. Scenario: We want to create a few unit files. We’ll first create a simple example unit file followed by a few more that we’ll use in later labs for load testing. Description=The most impressive unit file of all time. Notify systemd of the unit via `systemctl daemon-reload`. Note: this is safe to run on production systems. There are fringe cases when many thousands of unit files are being used where this can cause a periodic performance hit, but for the vast majority of systems this can be safely run at anytime. Start the unit with `systemctl start helloworld`. Pretty neat, eh? What did or did not happen? Next, let’s check the logs to see the output: `journalctl -u helloworld`. We’ll come back to journalctl in a later lab. In this section, we’ll do something slightly more interesting w/ our unit file. Notice that the unit name, helloworld, matches w/ both of these units. This unit will tell our system to listen on port 8080 and will activate the helloworld.service w/ a connection. In the original terminal run `curl http://localhost:8080` and watch the output from the second terminal. Why did it stop? Hint run the answer can be found in `systemctl show helloworld`. Don’t cheat yourself!! Find the answer before continuing!! Now that you have a renewed sense of self-worth from finding the answer w/ out looking ahead, please continue. Now pretend you didn’t cheat and raise the StartLimitBurst to something bigger than the default. Experiment with 50 or 500. Note, you will cause a large load on your system if you try w/ 5 million or something so resist the urge for now. Edit /etc/systemd/system/helloworld.service and under [Service] add StartLimitBurst=50. Notify systemd of the changes. Remember that command? Run the curl command again. What happened? Why? Restart helloworld.socket and run the curl statement again. Check the logs in the other terminal. How many times was helloworld.service started? Pretty slick. Unit files also have a powerful syntax for handling start order and dependencies. We’ll leverage some of this for our benchmarks. ExecStart=/usr/bin/sh -c "/usr/bin/ab -c 100 -n 999999 http://localhost/index.html &"
Let’s look at the dependencies of these units for a minute. “Wants” tells systemd that IF httpd & mariadb are installed to start them when these units are run. “After” means to start these units after httpd & mariadb are running. Let’s test this. Do the same for httpd & ab-bench. What was the result? What was different? Why did this happen? If it fails to start the first time, run `systemctl start ab-bench` a second time and see if it runs. ExecStart=/usr/bin/sh -c "/usr/bin/cat /dev/zero > /dev/null &"
Systemd tracks a wide range of options that can be customized per unit. Using drop-in configuration files it’s simple to customize and tune services. Scenario: We want to configure our VM so it is resilient and monitors the status of key services. Unit files here will take precedence over /usr/lib/systemd/system. This is where you want to copy your own unit files and make customizations. The above unit file for httpd instructs systemd when to start it in the boot processes, the type of service, commands to start, stop, and reload, as well as the target to install the unit in. This is the type of information needed to write your own unit files, but systemd provides many more options. Run `systemctl show httpd` and explore the output to see what’s available. While the defaults for unit files are sensible and won’t need to be altered most of the time, there will be circumstances where tweaking these is quite beneficial. These could include hardware or software watchdog monitoring, tunings, resource management, or many other reasons. We’ll modify the httpd unit with a drop-in configuration file. Open a second terminal and run `watch -n 1 systemctl status httpd`, note the uptime under “Active”, then from your original terminal run `sudo pkill httpd`. …..pretty neat huh? Remember we also set StartLimitAction=reboot; this will prevent service restart loops. Use the up arrow to quickly run `sudo pkill httpd` 7 times. What happened? Now we need to do something similar for mariadb. systemd will setup a single root cgroup hierarchy under /sys/fs/cgroup/systemd. This is used to keep track of services and their child processes. We’ll need to understand the following unit types. Scope - A transient, organizational unit that groups processes that have registered with systemd. User sessions, VMs, and containers are exposed as scopes for resource management. Service - A daemon or group of processes that systemd controls and monitors. By default, the system will have three slices: system, user, and machine. System.slice is the default location for service units. The services that ship will RHEL, e.g. httpd and mariadb, will be located in this slice by default. User.slice contains all user sessions and processes. The machine.slice contains VMs and containers, and isn’t created until one or more of these are started. Each of these slices are directly under the root slice and get equal scheduler time while the system is under contention. The default configuration prevents processes from any slice from monopolizing the entire system. It also goes a step further and prevents the same thing within each slice and scope. Previously scheduling time was done per thread, and services with a disproportional amount of processes received a disproportionate amount of CPU time. By default slices, scopes, and services default to CPUShares=1024. This will work perfectly for most workloads out of the box. Scenario: Become familiar with systemd’s tools for viewing and allocating resources at a service. 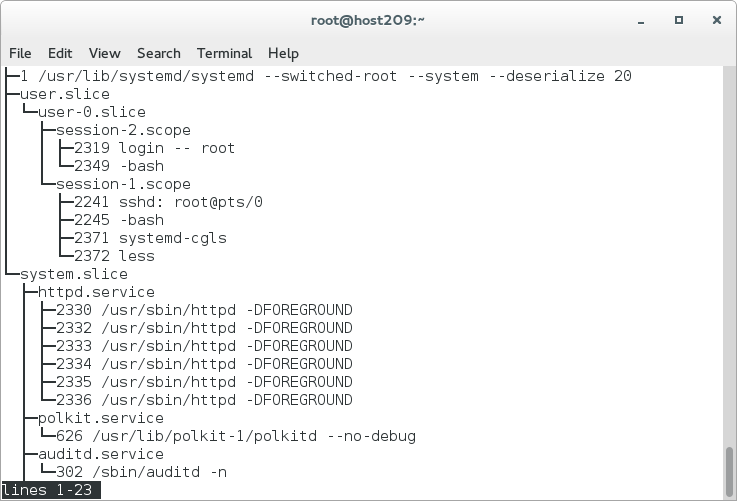 Run systemd-cgls to view the default hierarchy on our VM. Open a second terminal and run systemd-cgtop. Leave this running for the remainder of this section of the lab. This is always a good idea and will help prevent SFTHD, aka shooting from the hip disorder. Did the output of systemd-cgtop look as expected? We need to enable accounting for the cgroup controllers that we want to tune or monitor. The available high-level controllers, as of recent versions of systemd, are CPUAccounting, MemoryAccounting, TaskAccounting and BlockIOAccounting. Let’s enable three for httpd. Write the file and quit the editor. Which of course equates to `:wq`, since humans always prefer the vim editor. Now let’s run our benchmark again on the system. Run `systemctl start ab-bench` and monitor the output of the other terminal. Notice that system.slice & user.slice are both using roughly the same amount of CPU. Why is that? Hint look at the output of `systemd-cgls` and `top`. Note: The number of CPUs on the system will vary the percentage CPU split between the user & system slice. Why? Since both the system and user slice are at the same point in the same place in the hierarchy and default to CPUShares=1024, apache won’t starve the benchmark. Let’s enable the same controllers for mariadb. Write & quit the editor. This runs all our units from the earlier lab. Monitor the systemd-cgtop terminal. You might want to also open a third terminal and leave `top` running. With the system under load and cgroup accounting enabled, we can now start tweaking the cgroups. Let’s lower the CPU shares for user.slice to allow the system slice, and hence mariadb and httpd, more CPU time. Then do the opposite. After watching the difference reset the CPUShares to 1024. Right now httpd & mariadb have equal CPU time under the system slice. Let’s give httpd more. Notice that the user & system slices aren’t altered by this, but httpd and mariadb are. ***TIP*** In step 8 we’re making drastic changes to show how this works. It’s recommended to make smaller, incremental changes when doing this in real life. Instead of jumping all the way to 3000, start with something closer to 1200 and monitor the environment. If you need more CPU time on the scheduler, move to 1400, etc. Also note that cgroup accounting is expensive and should be disabled after the tuning is complete. Let’s promote httpd to it’s own slice. This is useful if you have an application or service that you want to guarantee gets significantly more scheduler time than other user or system processes/services. Slice=apache.slice #<---remember the ‘S’ in Slice is case sensitive. Did that do what you expected it would? 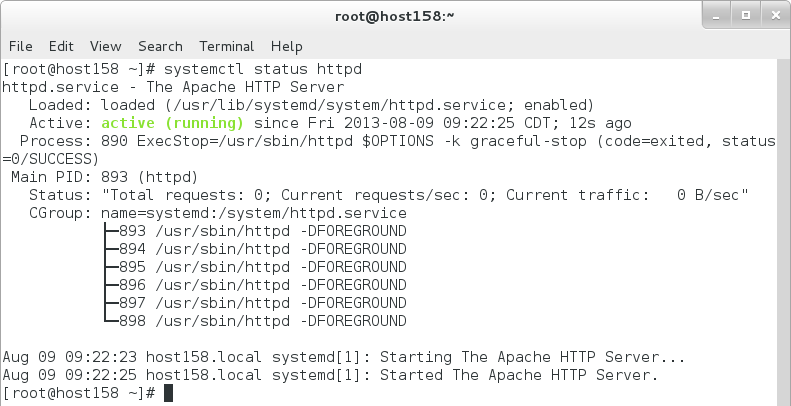 Run `systemctl status httpd` and notice the loaded drop-ins and new cgroup. Once the settings are configured appropriately for your use case and workload, drop the --runtime option to persist the settings. Run `ls /etc/systemd/system/httpd.service.d/` and investigate the files that were created. Is this what you expected to see? systemd includes a powerful logging component called the Journal. The systemd-journald service captures all logging messages with metadata, indexes them, and exposes them to the user via a utility called journalctl. In Red Hat Enterprise Linux 7 the journal is not persistent by default and forwards all messages to rsyslog. Rsyslog is the default logging daemon because of the rich enterprise features it provides. That said, the journal provides an amazing toolset and can be leveraged in parallel or in place of rsyslog. Scenario: Become familiar w/ the journal and learn how to filter it. Run `journalctl` and page through using the spacebar. Notice that any warning messages (technically notice & warnings, priorities 4 & 5) are bold and errors are red. The formatted text will instantly draw your eyes to messages at these priorities. Filter the journal by priority, starting at 7 and working to 0. *Notice that by default the output is formatted or “paged” with less. Don’t forget that you can use the right and left arrows to scroll horizontally on smaller terminals. This can be disabled by passing the --no-pager option. Non-root users will need to be in the systemd-journal group to access to the system’s journal. On some distributions the journal writes to a ring buffer in memory. To enable persistence simply run: `mkdir /var/log/journal` and restart the systemd-journald. Next let’s use shell completion to help us filter the journal. Type `journalctl [tab] [tab]` notice that _EXE is one of the fields. Pick a binary or two listed and view the output. Step 6 helped us quickly identify what’s currently in the journal. If there’s a binary you want to filter by simply append it. Just like with systemctl we can “glob” files and the output will be interleaved. This is incredibly useful for seeing how services, applications, users, etc interact with each other. We can put these filters together to quickly view specific & relevant logs quickly. 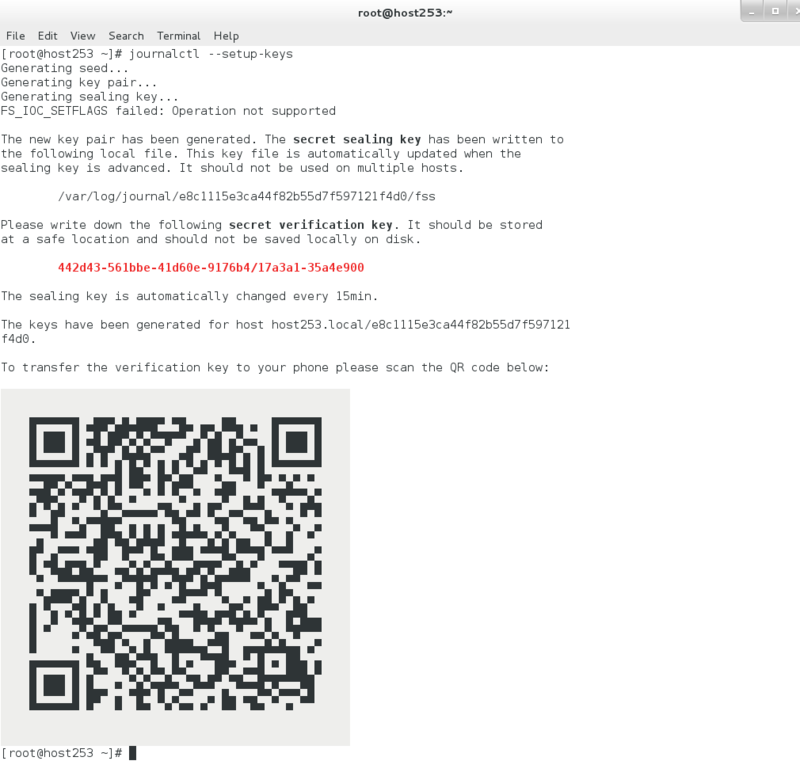 Run `journalctl --setup-keys` As the name implies, this command will create the key pair used to seal the journal. It is important not to store the validation key on the local system. The QR code makes it simple to transfer. With the remainder of time, pick a component of systemd that you’re least familiar with and do some self-study. This could be anything from reading man pages, blog posts, or experimenting with a live system. Anything goes!